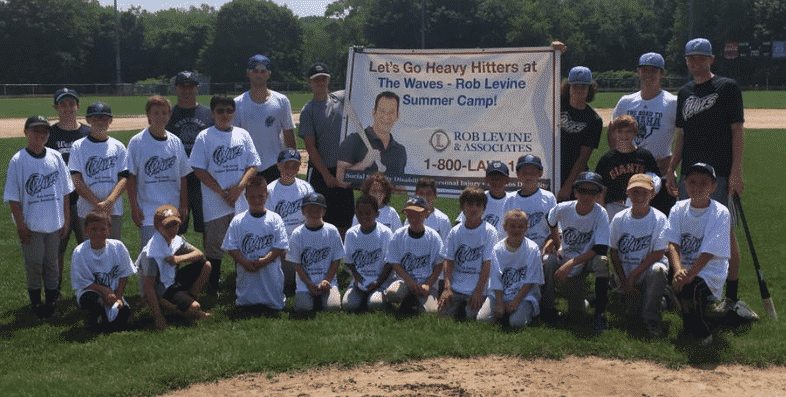 Providence, Rhode Island (April 20, 2018)- Rob Levine and Associates will once again partner with the Ocean State Waves baseball camp and will be awarding 15 scholarships to young athletes to attend the Ocean State Waves Rob Levine Summer Baseball Camp. These scholarships provide opportunities for youth baseball players to experience a week of fun activities and training with college players to help hone their skills and expand their knowledge in baseball. The goal of the camp is to encourage a safe and healthy lifestyle and to support youth programming. Applications for scholarships are due June 15th and can be accessed via the Ocean State Waves website. The South Kingstown camps take place between the weeks of July 9th and July 16th and the Westerly camp will be held the week of July 16th. To qualify for the scholarships players must be between the ages of 8-14 that can have transportation to and from the Waves Summer Baseball camp. “Sponsoring this camp is something I truly enjoy because it provides kids with exposure to the outdoors. It teaches them about sportsmanship, teamwork, and other important skills that promote a healthy lifestyle from a physical and mental perspective. We at Rob Levine and Associates are fortunate to be able to give back to our community. Our community supports us by allowing us to serve and advocate for them, and we really enjoy giving back in any way we can.” Says Rob Levine. For more information on the Rob Levine’s Heavy Hitter Scholarship or the Ocean State Waves Rob Levine Summer camp visit the signup link here. We know him as the Heavy Hitter and in his current occupation as an Attorney, helping individuals who have been hurt in an accident or who are disabled. However, you may not be aware of Rob Levine’s background. Rob’s Rhode Island roots started many years ago serving as a Police Officer within the Central Falls Police Department. From an early age, Rob knew he had a calling. At sixteen, when most kids his age were simply out being kids, he became part of the Glen Rock Volunteer Ambulance Corps, holding a position of EMT (emergency medical technician). He was promoted within a year to Crew Chief. During his nine years of commitment and dedication, he rose through the ranks to become second-in-command of a fifty-person rescue squad. This was the beginning of his call to serve.